Do you remember those orange creamsicle push-pops that we used to get as kids? They were part of the definition of summer. Swimming, camping, push-pops…. My daughter is a huge fan of orange creamsicle ice pops, but not a big fan of biting into a hard pop or dealing with melting ice cream running over her hands, so I thought I’d try to create a homemade no-churn Orange Creamsicle Ice Cream that has all of the flavor but less of the mess! Because less mess is good when it comes to food! This homemade creamsicle ice cream come together in less than 10 minutes, and after a short freezing time you can enjoy a soft and creamy orange-flavored ice cream that you can feel proud serving to your family or guests. Unlike my homemade root beer float ice cream, where I used root beer extract to get the flavor, for this Creamsicle ice cream I used orange soda to relay that orange flavor to the ice cream. Any orange juice or drink will work — I’ve used an orange-ade type drink and orange juice both to similar results. The vanilla helps create that creamy vanilla-orange flavor so don’t skip it! Whip the whipping cream for 4 minutes until it billows up like a cloud – you will think it’s never going to thicken to that point but towards the 4 minute mark you’ll start to see a visible difference. Keep going until it looks like it came out of a whipped cream can. Mix in the sweetened condensed milk and vanilla until just blended. Pour in the orange soda, fold gently, and then pour out into your container. 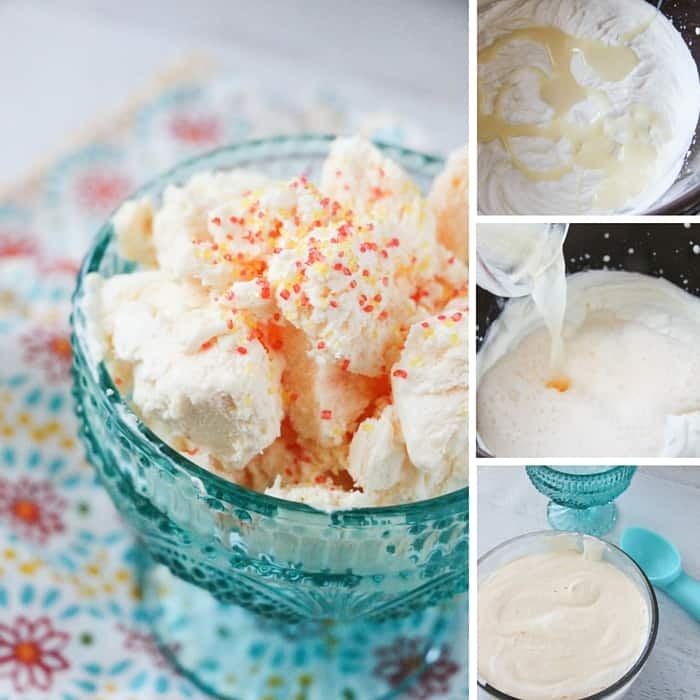 You can garnish with sprinkles, orange zest, or even make a creamsicle float by topping with a bit of the orange juice or soda you used to make the ice cream! Do you have an orange creamsicle fan in your home? 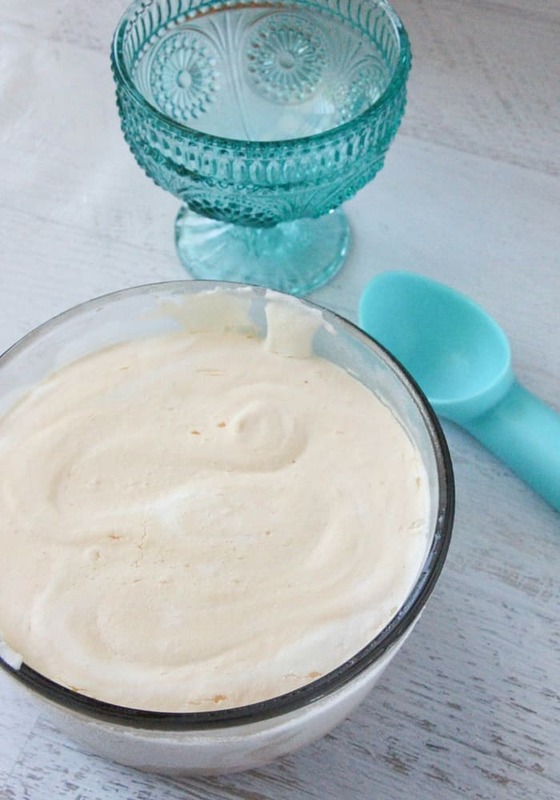 Have you ever tried making homemade ice cream? 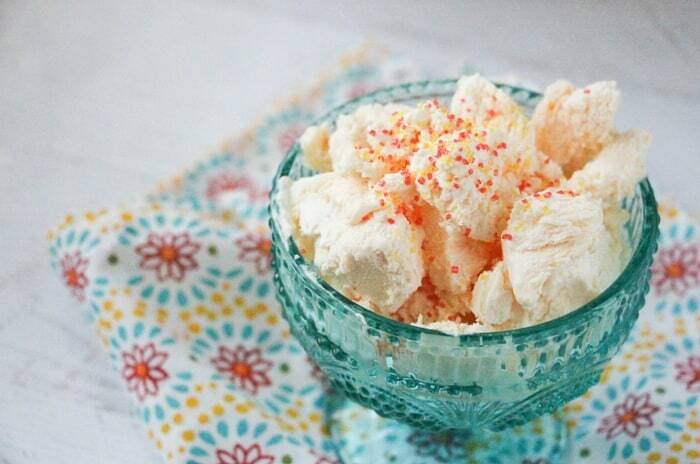 This orange creamsicle ice cream is the perfect summer dessert! Made with no-churn ice cream so you can enjoy a special dessert without an ice cream maker.